While one of our children's friends was visiting, we decided to get the kids to make their own pizza's for dinner. I set up a selection of toppings on the table and let the kids go crazy, using a pita bread pocket as their base. They had heaps of fun (so did we) and begged to make more afterwards. So easy to do (especially for you guys who struggle to cook something) and fun to make. Using a pita bread pocket as your pizza base, spread 1 tablespoon of tomato paste on top, and then the toppings of your choice. Bake in oven (approx 180degC) until cheese is bubbling. 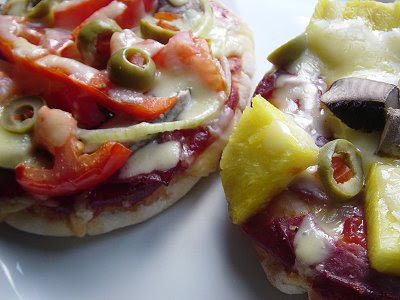 Topping ideas: sliced mushrooms, ham, salami, chicken, olives, tomato (fresh or sundried), cheese, pineapple pieces, sliced onion, red or green peppers etc. Definately my favourite way to have pizza at the moment! Definitely hot, fresh and tasty! Thanks for your great recipe idea, kristy! I love pita pizza..it's a regular at my house. Thanks for your earlier message. I couldn't find your email to reply. These look yum! Keep the ideas coming. I'm always looking for things the kids will eat, great getting them involved with the making.